. 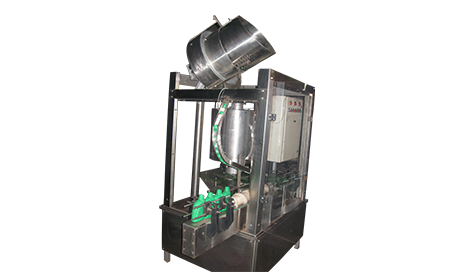 Screw Capping Machines are suitable for tightening PP Caps on containers.
. Capping Tools are designed in different ways depending on the Cap design.
. Bowl Feeder is used for feeding caps automatically on to the containers in proper position.
. Pressure feeding/Screw feeding of containers is done depending on the container shape.
. Capacity up to 100 containers/ min.
. Machine has a variable speed over a continuous range.
. Machines are fully automatic.
. Machines require very less maintenance.